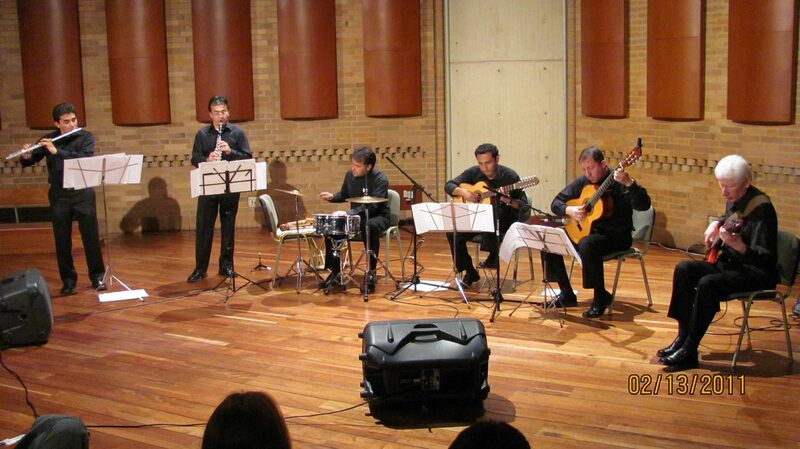 Ensamble Cónclave, begins in the year 2004, with the purpose of performing music from the Colombian Andean zone, where the academic creativity of each one of its players comes out in each one of its interpretations giving the public the possibility to recall those musical groups that became icons of the traditional Colombian music styles. That´s how the Ensamble Cónclave, “captivates the audience” touching the roots of the tradition, without stepping aside from the new trends which the new generations brings to life. Ensamble Cónclave has been invited in several occasions to important music festivals such as the Festival de la Plaza at Ginebra ( Valle del Cauca Colombia), the Mono Nuñez, ( Andean music festival), the Festivalito Ruiotoqueño at Floridablanca Santander ( Colombia) , the Hato Viejo festival at Bello Antioquia (Colombia). Among the awards that the Ensamble Cónclave has received stands out winning the invitation for the Colombian Music of La Secretaria Distrital de Cultura y Turismo 2007, the prize for best unpublished work 2008 with the performance of the “pasillo” (Colombian musical air) Celitos, German Darío Pérez composer, at the XXXIV Festival Mono Núñez, second place at the Festival Nacional del Pasillo, en Aguadas ( Caldas Colombia) and second runner up at the first edition of the biennial of Andean Music of Colombia CAFAM in the year 2011. No Replies to "ENSAMBLE CÓNCLAVE"